Happy Media Monday Tuesday! Also happy Birthday Month to meee~! That’s right, it’s March which means a whole month of sunshine and happiness awaits (she says, as it pours with rain outside, huhm)! Right now, I cannot stop watching Produce 101. It’s a Korean survival style show where they start with 101 trainees from different entertainment companies and whittle them down to a group of 11 girls who will then promote for a year. 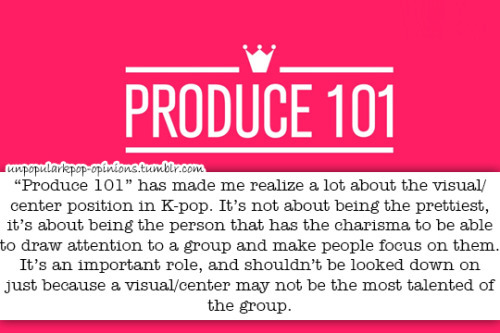 The 11 are chosen 100% (to some extent) by voting, so they should be the people’s choice. Obviously, the editing goes a long way to influence perception. BUT, this is life, if you cannot stand out in a room of talented women with any kind of angle, how will you compare in an industry with a much larger pool of talented women? 1. It is true to life. This is a popularity contest and anyone who thinks skill will win out is deluding themselves. I know some people are really bothered by that, but I mean duh? 2. I had no idea how complicated things were. Wow. So when I’d heard things like, “Oh this person is the visual” and, “This person is the leader”, I thought those were just ceremonial titles and not actual like jobs. It’s easy to think that the trainers have the final say, but watching this show I realise that those trainers can’t be with the trainees the whole time. 3. Shows the importance of practice over skill. Practice MVs have spoiled me, I no longer think of practice as something gross, sweaty and hard. But this show reminded me that practice means hard work and hard work doesn’t always look or feel great, sometimes it just feels like WORK. Um, why didn’t anyone tell me how awesome Kara’s debut song was? Or how awesome SNSD’s debut song was? All of you, shame on you, no-one told me. Shame. Yes I know the dance routine and all the words to the song. Yes I do the dance in the mirror at work, no I do not regret putting this out there in print. I vote based on skill, charisma & who I want to see more of. I’m surprised that people who properly debuted were allowed to participate. Those who have debuted aren’t really doing all that well and this show kind of just highlights how weak they are. I’m not sure if doing this was a good idea for them, because those who haven’t debuted and are crushing it just look like the deserve the chance more yanno? Previous Post Smarter Shopper: The Seasonality Heuristic.